In the first part of the “Spybaiting Around the World”, we “unmasked” spybaiting with Bassmaster Magazine, however the truth is that the news about spybaiting came first from Wired2Fish`s writer Jason Sealock, who put a few lessons on the technique of the silent capture in his “Learn to Spy-bait” article. Have a read below. Clear water bass fishing often confounds anglers. Something about the bass being able to see what we’re doing and where we’re doing it forces us to take new approaches. Drop down in line size. Tie on smaller lures. Make longer casts. 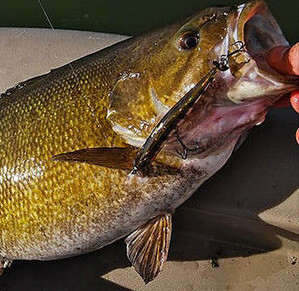 Look for techniques the bass haven’t seen before, like spy baiting. I grew up fishing on clear Ozark streams and lakes, and became well versed in the natural presentations that would often fool bass foraging in clear waters. So when I first learned of the Japanese technique spy-baiting (supaibeiting) or Silent Capture (sairento kyaptya) from David Swendseid of DUO, it made sense to me. The Realis Spinbait 80 was designed by Masahiro Adachi (pictured below), a very well-known and respected lure designer in Japan, specifically for this technique. It features a small profile, intricate detailing, spinner blades that pulse at ultra low speeds need for the technique and super sharp hooks. DUO was a bit hesitant and reluctant to bring the technique and their bait to the US market because they felt we wouldn’t appreciate the finesse approach as much as our power-fishing techniques. There are some keys to spy baiting that anglers must realize first to be successful. We are going to naturally look at the Realis SpinBait 80 and think it’s a topwater double prop bait, only smaller. It looks more like a detailed finesse jerkbait. But the key is this bait weighs 3/8 ounce and it sinks, quickly. It has a fixed ballast system that not only lets you cast it a mile, but on the fall, it shimmies and rolls and falls in a horizontal position, not nose down. Once you get it to the depth you believe the bass are holding, you simply reel it ultra slow, albeit fast enough that it will roll and shimmy as the blades turn. Because the action is subtle yet noticeable, it won’t call bass from great distances to the lure. You’re going to need to fish it where the bass are and in water clear enough for them to see it. As I recalled on Table Rock last week, I’m often faced with fishing on clear-water fisheries where I know fish are in the area because they are following lures back to the boat but not eating them. This technique and lure seem to answer that problem to an extent. The technique is pretty straight forward with long casts, counting down to the right depth and then reeling it slowly along trying to keep the bait down. What brings the bait up is resistance in the water. The higher diameter lines will pull the bait up. While too heavy a fluorocarbon will pull it down where it can get hung. You just point your rod tip at the lure and slow reel, trying to avoid contact with the bottom or cover but keeping it down in the water column where you think the bass are foraging. It takes a little practice and patience to get the lure to fish right for you. The biggest key is choosing a small-diameter fluorocarbon like 4- to 5-pound test that will keep the bait in the strike zone longer while still keeping it off the bottom. Remember it doesn’t have a lip so if it goes to the bottom it can snag pretty easy. Swendseid and other anglers who have perfected the technique in Japan say that 6-pound test is really pushing the limits because after that the bait gets pulled down by the line or the diameter causes too much drag in the water. I fished mine on 10-pound braid (4-pound diameter) with a 6-pound fluorocarbon leader and caught more than 30 bass the first day with it on a pretty “tough” Table Rock Lake. But the fish I was catching were suspending, surfacing, chasing and looking in the area. I think as fish are not as grouped up and competitive the line size could be a bigger factor. It’s like a cross between a subtle crankbait, spinnerbait, swimbait and even jerkbait in one. It’s not going to call fish from a distance like those lures might, but if a bass is in its zone, it seems they have a hard time resisting it’s natural pulse and flow. My other boaters last week threw topwaters, jerkbaits, soft jerkbaits, swimbaits, drop shots, and more, and the SpinBait80 was catching them 10 to 1 over those other baits. I don’t know if it was because of the ultra-clear water on Table Rock Lake. I don’t know if it was the way it moved like a bait singled off from the schools of minnows the bass were busting up. The fact that it kept moving slow and steady through the strike zone while other baits went over, under and darted around seemed to matter in these particular conditions. The Spinbait 80 is small, has two sharp trebles and can be thrown a long way. I was catching fish on small swimbaits fished nearly the same way. However I would catch one bass for every 4 or 5 that hit the swimbait. With the Spy Baiting technique, I caught nearly every bass that slapped or slashed at it. It’s such a small profile with more hooking options. Swendseid has caught big bass on the lure, including an 11-pound largemouth and many big smallmouths from the Columbia River. It’s considered an effective big bass technique on Japan’s famed big-bass Lake Biwa. Check your line, often. I had an unbelievably fun few mornings until a 4-pound spot came up from behind the bait, short lined me, and broke off the single bait I got from DUO at ICAST. Truth be told I was so excited about catching them, I forgot to check my line often enough. I just ordered 3 more from TackleWarehouse, although I don’t see it being particularly effective on my local lake because of the lack of visibility. I just don’t want to be caught without one now when the conditions call for the spy-baiting technique. Share the post "Spybaiting Media Spotlight #2: Wired2Fish"